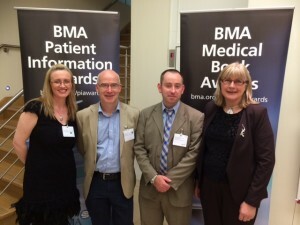 Adolescents and Substance Use: the Handbook for Professionals was highly commended at the British Medical Association annual book awards on the 22nd of September 2014 in London to which 670 books were submitted for consideration. Ann Campbell, a Systemic Family Psychotherapist and current Chairperson of the Family Therapy Association of Ireland, co-authored the book with three colleagues. This team working with young people with substance misuse problems was aware that there was no single book available that could answer other professionals’ questions about the broad topic. Some academic books exist which are very specialised and so do not meet the needs of the practitioner working with adolescents who does not need to be a substance misuse specialist. In the summer of 2011 the four colleagues began the journey of trying to meet this need. A proposal for such a book was submitted to an international publisher as it was intended that the book would have international appeal. In spring 2012 the proposal was accepted and over the following year the book was written and a final draft handed to the publisher in Spring 2013. The book was published in late 2013 by Radcliffe Publishing, London.